Red Ranger dogs take center stage in a big way! PR Bowling Red Ranger Crimson Tara wins BEST FEMALE At Riverside California under the honorable judge Fred Lanting on Oct. 12, 2002! PR Bowling Red Ranger Crimson Tara took BEST FEMALE in Virginia under the honorable judge Fred Lanting on March 17, 2002! Tara is owned and handled by Lori Bowling of Virginia. Tara was sired by PR Red Ranger DNA-VIP and her dam is PR Red Ranger Flashfire DNA-VIP. Congratulations Tara and Lori. We're so pround of you both. 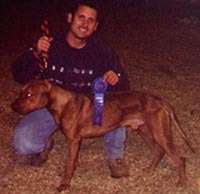 PR Red Ranger took BEST ADULT MALE at the UKC Carolina Classic in Charlotte, N.C. on 3/4/2001. This was his first time in the show ring ! Ranger won under the honorable Judge Walt Pasko. 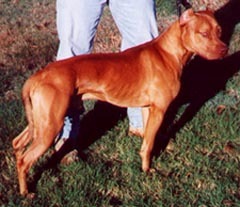 Ranger was handled by Harry Ballard of Red Ranger Kennels. We're SO proud of you, Harry and Ranger !!!!!! 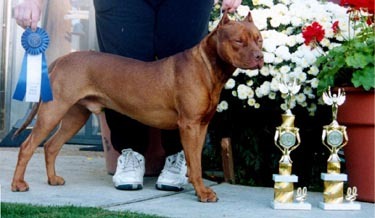 CH PR Amberlt Col Riv Red Ruckus took BEST MALE to become a CHAMPION at the Mid-Valley Kennel Club of California under judge Deborah Smith on Oct. 28, 2000 !! 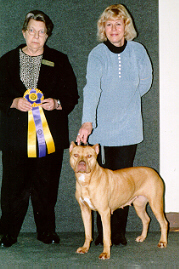 Ruckus also took Reserve Champion of Champions on Oct. 29, 2000 under judge Jackie Lowe. Ruckus is owned by Tim Auringer. Ruckus was sired by GRAND CHAMPION PR Amberlt Col Riv Red Ranger Rip and his dam is PR Amberlt Red Ranger Ryder. Ruckus is a grandson of Red Ranger, Red Ranger Sassy , Red Ranger Red Wildfire, and Squires Red Shredder. After visiting be sure to hit your back button to come back to our site. 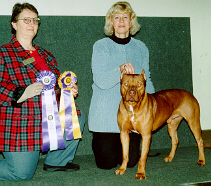 CH PR Amberlt Col Riv Red Ranger Rip took the Champion of Champions Class win to become a GRAND CHAMPION in Washington State at the Cascade American Pit Bull Terrier Club on 11/28/99.This was his fifth Championship win. Rip won under the honorable Judge Diane McDermitt. Rip was handled by Carol Gaines-Stephens (my friend and mentor) Rip is owned by Gary and Carol Stephens. Rip won 2 of his Champion wins being handled by Gary Stephens and he won 3 of his Champion wins being handled by Carol Stephens. Thanks so much Carol and Gary !!!!! 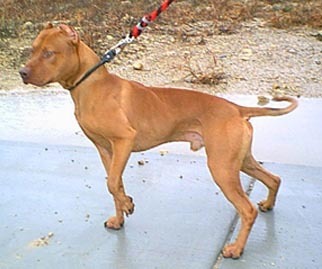 Rip beat out 16 other dogs in his class, including some the of top ten UKC Pit Bull Terriers in the nation. Way to go Rip !!!!! Rip then went on to take a UKC BEST IN BREED !!!!! beating out 56 American Pit Bull Terriers and then went on to take the club's BEST OF SHOW !!!!! beating a total of 85 dogs at the Cascade Am. Pit Bull Terrier Show, including Irish Settlers, German Sheperds and Toy Fox Terriers. We're SO proud of you, Rip!!! 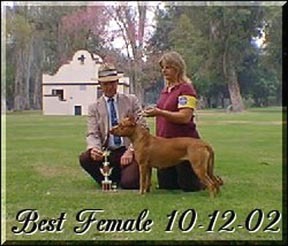 CH PR Amberlt Col Riv Red Ranger Rio took her 2nd CHAMPION of CHAMPIONS Class win beating out 16 other American Pit Bull Terriers in her class in Washington State at the Cascade American Pit Bull Terrier Show on 11/28/99. Rio won under Judge Bernice McDermitt. Rio was handled by Carol-Gaines Stephens. Rio is owned by Gary and Carol Stephens of Vancouver, Washington. Way to go Carol and Rio !!! PR Neimann's Red Ranger Midnight Sun AKA Tsavo took 1st place in his class at an ADBA show in Texas on 11/28/99. Tsavo won under Judge Colleen Hill. Tsavo was handled and is owned by Kerry Niemann of Texas. It was only the 3rd time Tsavo was ever shown in the ring. He then went on to beat all the dogs that won in their class and took BEST IN SHOW !!!!! Way to go Kerry and Tsavo. Kerry has trained Tsavo by running him 9 miles a day. Tsavo pulls Kerry on roller blades or runs beside him while Kerry rides a mountain bike. Tsavo also has been swimming as part of his training.Gary Hammonds(ADBA show judge) recently used Tsavo as an example of the World's most conditioned UKC dog. Thanks for the compliment Gary. Tsavo in peak ADBA condition WOW!!! Tsavo at 2 years of age and looking good! 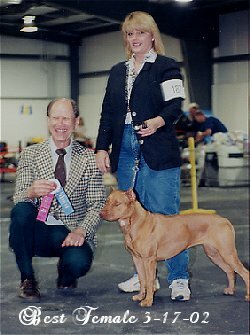 T n T's Red Ranger Gambit took Best Stud Dog in a fun match event at an ADBA show sanctioned by the Southeastern American Pit Bull Club in Charlotte, N.C. on 11/20/99. Gambit is owned by Ronald and James Tucker of N.C. Keep up the good work guys! We at Red Ranger Kennels want to thank Tim, Carol and Gary, Kerry, Ronald and James for all the hard work they have done to show the country what the Red Noses can do! We are looking forward to the future in the Year 2005 and we hope everyone does well in their endeavors this coming year. Thanks to all of you who worked so hard!